Fruit, yogurt and granola have been the traditional first course for breakfast here at Blueberry Cove Inn for 12 years. It has been so popular that we believe that a certain fast food place that used to sport yellow arches ripped off the idea. We in Narragansett have big hearts and realize imitation is actually flattery so we will give them a pass. But, what do you do when you go to the store to buy fruit and yogurt for breakfast but get so very distracted by the fruit department that you completely forget the yogurt? First you are glad that Innkeeper Dave is out of town and won't find out about it. Then you get creative. I just happened to have the perfect, albeit offbeat, solution in the fridge. 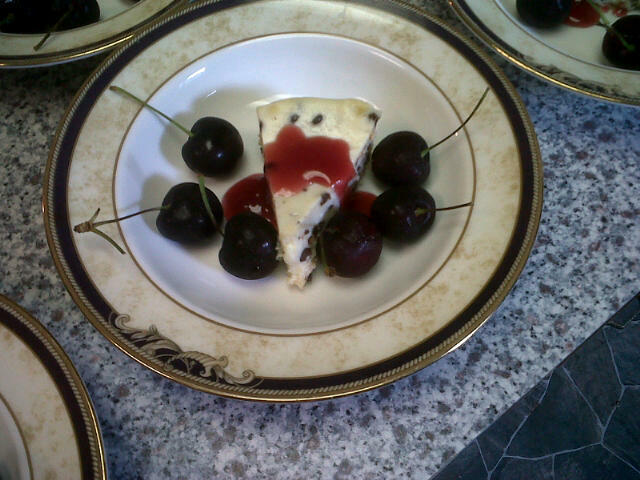 Everyone should have cherries and a small slice of chocolate chip cheesecake for breakfast once in awhile. It's crustless and good for the soul.﻿ Wish you were here mom, I stole the idea from you.